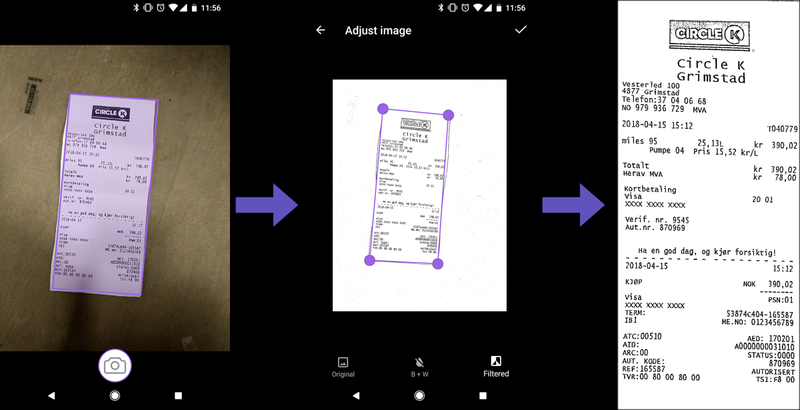 How to scan documents and receipts with your Android phone. Use the document scanning feature to create PDF or PNG documents in Jottacloud. The document scanner is a great way to capture notes, receipts or whiteboard sessions to a shareable Jottacloud document. The document scanner now creates a preview of the document. To rotate the document, press the rotate button. this will rotate the document 90 degrees counterclockwise. To adjust the edges or the readability of the document, press the adjust button. You can grab the corners of the edge border outline to correct the perspective and boundaries of the document. To save the document, press the top-right arrow. Provide a document file name and select the document file format (PDF or PNG). Press Save to upload the document to Jottacloud.